IBM's Watson computing platform has been used to tackle everything from playing chess to studying diabetes -- and now the platform's cognitive computing prowess is being applied to the highway. Big Blue and Local Motors, a vehicle technology integrator and creator of 3D-printed cars, have developed a self-driving vehicle to integrate the cognitive computing capabilities of Watson. Unveiled during the opening of a new Local Motors facility in National Harbor, Md., the vehicle, called Olli, can carry up to 12 people. It features IBM's Watson Internet of Things (IoT) for Automotive platform. Watson IoT for Automotive enables vehicle-to-cloud communications. It not only transmits data to and from vehicles, but, when coupled with the IBM analytics portfolio, it delivers insights that support the driver and helps the vehicle operate more efficiently. The vehicle itself can also communicate with other IoT-connected vehicles and the surrounding connected infrastructure, providing information such as geolocation, traffic congestion, and weather conditions. The platform also processes data from embedded sensors in the vehicle, which can help improve passenger safety, the driver's experience, and the efficiency of the overall transportation system. Cognitive computing provides incredible opportunities to create unparalleled, customized experiences for customers, taking advantage of the massive amounts of streaming data from all devices connected to the Internet of Things, including an automobile's myriad sensors and systems. Olli leverages four Watson developer APIs, including Speech to Text, Natural Language Classifier, Entity Extraction, and Text to Speech, to enable interactions between the vehicle and passengers. In essence, Olli acts as the world's most helpful bus driver, helping its passengers find local destinations like popular restaurants or historical sites based on an analysis of their personal preferences. It can also field questions about why it is making certain driving decisions. In addition, Olli can answer queries such as how the vehicle works, where the passengers are going, and other topics to foster interaction during the journey. 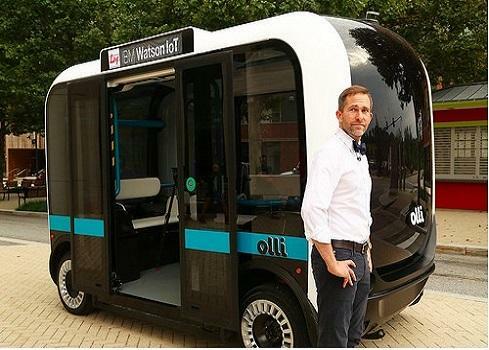 Olli is currently being used on public roads locally in Washington, D.C. Miami-Dade County in Florida is exploring a pilot program in which several autonomous vehicles would be used to transport people around the city. While the 3D-printed, self-driving bus represents a new evolution in the autonomous vehicle space, IBM and Local Motors are far from the only companies investing in this technology. Automakers such as Ford, Chrysler, Nissan, and BMW are investing heavily in self-driving vehicle technology, while a recent IHS report highlighted the impact machine learning platforms and artificial intelligence are having on the future of automotive technology.